Talbot 1510/Talbot Alpine. 1979–85 (prod. 75,753 France only; 14,047 Finland only). F/F, 1294, 1442, 1592 cm³ (I4 OHV). The facelifted version of the 1307–9 was launched late 1979 at Paris Salon. Officially the Talbot–Simca 1510 in France initially. Arrived in UK in 1980. Sales down on predecessor in France, so production ceased in 1982, though it continued in Spain, UK and Finland till 1985. Series 2 in UK from 1982, and Minx and Rapier trim levels there from 1984. Final cars sold in 1986, with Talbot brand withdrawn from passenger cars. 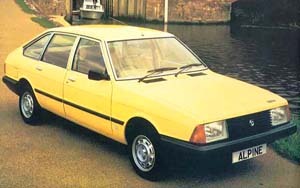 Booted version called Talbot Solara.